Julie Whitehead was inspired to volunteer for Winship Cancer Institute's Patient and Family Resource Center following her own cancer treatment 13 years ago. Julie Whitehead was inspired to volunteer for Winship Cancer Institute's Patient and Family Resource Center following her own cancer treatment 13 years ago. She says, "Some of the most helpful individuals were those who had been through treatment themselves. They helped me get through the scary unknown. Their strength showed me that I too could be a survivor." 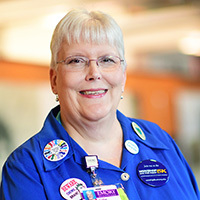 Since then, she's logged close to 1,500 volunteer hours at Winship doing everything from serving on Winship advisory committees to wheeling the snack cart through the infusion center. In 2016, Whitehead was recognized for her exemplary service, teamwork, and a commitment to public good when she became one of the inaugural winners of the Robert L. "Bobby" Rearden Spirit of Winship Award. "Julie has been an inspiration to everyone at Winship, especially patients and staff," says DaVida Lee-Williams, director of the Patient and Family Resource Center. "She is a great person with a big heart who is dedicated to making the patient experience at Winship the very best it can be."